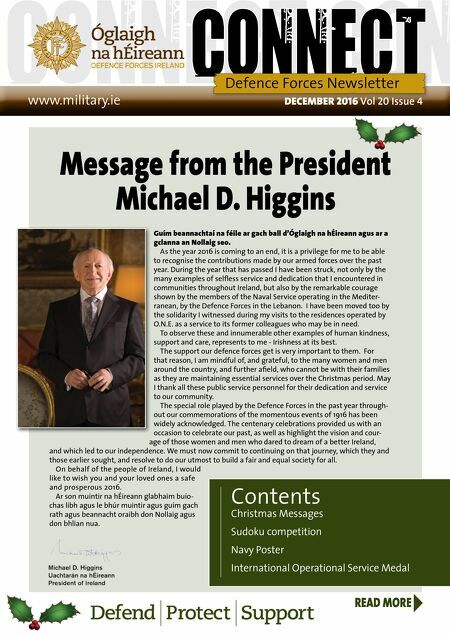 december 2016 Vol 20 Issue 4 www.military.ie Defence Forces Newsletter READ MORE Message from the President Michael D. Higgins Contents Christmas Messages Sudoku competition Navy Poster International Operational Service Medal Guím beannachtaí na féile ar gach ball d'Óglaigh na hÉireann agus ar a gclanna an Nollaig seo. As the year 2016 is coming to an end, it is a privilege for me to be able to recognise the contributions made by our armed forces over the past year. During the year that has passed I have been struck, not only by the many examples of selfless service and dedication that I encountered in communities throughout Ireland, but also by the remarkable courage shown by the members of the Naval Service operating in the Mediter- ranean, by the Defence Forces in the Lebanon. I have been moved too by the solidarity I witnessed during my visits to the residences operated by O.N.E. as a service to its former colleagues who may be in need. To observe these and innumerable other examples of human kindness, support and care, represents to me - Irishness at its best. The support our defence forces get is very important to them. For that reason, I am mindful of, and grateful, to the many women and men around the country, and further afield, who cannot be with their families as they are maintaining essential services over the Christmas period. May I thank all these public service personnel for their dedication and service to our community. The special role played by the Defence Forces in the past year through- out our commemorations of the momentous events of 1916 has been widely acknowledged. The centenary celebrations provided us with an occasion to celebrate our past, as well as highlight the vision and cour- age of those women and men who dared to dream of a better Ireland, and which led to our independence. We must now commit to continuing on that journey, which they and those earlier sought, and resolve to do our utmost to build a fair and equal society for all. On behalf of the people of Ireland, I would like to wish you and your loved ones a safe and prosperous 2016. Ar son muintir na hÉireann glabhaim buío- chas libh agus le bhúr muintir agus guím gach rath agus beannacht oraibh don Nollaig agus don bhlian nua.